In many ways the U.S. visa application process is the same whether you are applying for the first time or renewing your visa. It is important to know that your visa may still be valid even if the passport it is in has expired. You can travel to the United States with an expired passport containing a valid visa as long as you also bring your new, valid passport. Please see the website http://ustraveldocs.com/hk for more details. To expedite the visa application process, interview waiver might be an option for you. In most cases, this service eliminates the need for an interview. However the use of interview waiver does not guarantee visa issuance. Furthermore, in some cases, after reviewing an application submitted through interview waiver, we may require a person to appear for an in-person interview. You may be eligible to apply for a U.S. visa without an interview based on your age; or if you are renewing a prior U.S. visa that expired less than 12 months ago (only B1/B2, C1/D, F, M or J visas are eligible for this program at this time). Children under 14 years of age, and applicants age 80 or older, may apply through interview waiver for a B1/B2 visa if they have not previously been found ineligible for a U.S. visa. Please see below in “Supporting Documentation" to ensure the correct documents are included with the application. Applicants must be a citizen or resident of Hong Kong or Macau (proof of residency in Hong Kong or Macau is either a Hong Kong or Macau ID, or a visa with the "right to abode and work."). Applicants must be physically present in Hong Kong or Macau. Children under 14 years of age must not have a U.S. Citizen parent (unless the parents can provide documentation of a formal finding by the U.S. Consulate’s American Citizen Services Unit that the child is not a U.S. citizen) or a parent who is a Legal Permanent Resident (green card holder) of the United States. You may also be eligible to apply through interview waiver if you were previously issued a U.S. visa and you can provide the previous original U.S. visa. Your prior visa must have been issued to you when you were age 14 or older, and your fingerprints must have been collected. You must be a citizen or resident of Hong Kong or Macau (proof of residency in Hong Kong or Macau is either a Hong Kong or Macau ID, or a visa with the "right to abode and work."). You must be physically present in Hong Kong or Macau. You must be applying for a B1/B2, C1/D, F, M, or J visa. All other visa classes are not eligible for interview waiver at this time. You must be applying for the exact same type of visa. For example, you had a B visa and wish to apply for another B visa. Your previous visa must still be valid or it must have expired within the last 12 months. You may not use interview waiver if you lost your previous passport that had a valid or expired U.S. visa. You may not use interview waiver if you are applying for a B1 domestic helper visa. Student visa holders (F, M and J) are only eligible for interview waiver if they are continuing to attend the same U.S. school or institution or participate in the same exchange program in which they are already enrolled. A valid passport: Passports must be valid for at least six months beyond your intended period of stay in the United States. One photograph: Two inches square (51mm x 51mm) color passport/digital photograph, less than 6 months old, against a white background, full frontal view. Detailed guidelines for taking and submitting a quality photograph are on the U.S. Department of State website here. Your application will be refused if your photograph does not meet the requirements. A copy of your Hong Kong or Macau identity card or your visa with the "right to abode and work". Printed interview waiver confirmation letter with barcode. A copy of the photo page of both parents' passports and a copy of both parents' Hong Kong or Macau ID cards. A copy of at least one parent's valid U.S. visitor (B1/B2 or B2) visa. If one or both parents is a national of a country whose citizens can travel to the United States on the Visa Waiver Program (VWP), a copy of an Electronic System for Travel Authorization (ESTA). Please see ESTA - Electronic System for Travel Authorization for further information. If neither parent has a valid U.S. visa or travel authorization, the child is not eligible for interview waiver. *For all other children: Children under age 14 are not qualified for interview waiver if any of the required documents are missing. If not qualified for interview waiver, an appointment is necessary for the child’s visa application. At least one parent must come to the U.S. Consulate to be interviewed. The child need not accompany the parent to the interview; however, the child must be physically present in Hong Kong or Macau at the time of the interview. Any previously issued U.S. visa. 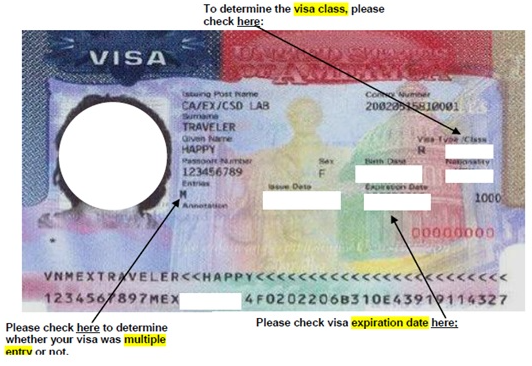 A passport containing the applicant’s previous original U.S. visa in the same category. All passports issued between the time the applicant’s previous U.S. visa was issued and the present. Passport containing the applicant’s previous original U.S. visa in the same category. If you meet the requirements above, follow the steps below to create a profile and continue the application process. Please note: for applicants who have a name in Chinese characters, you must complete the four-digit telecode in your DS-160 application. The telecode question can be found at “Personal Information 1” on the DS-160, which asks “Do you have a telecode that represents your name?” Please click “yes,” then there will be space provided for you to fill in your telecode. If you do not know your telecode, you may wish to visit this website for details. Log-in to our online applicant system and create a profile to pay the visa application (MRV) fee at 7-11 or by credit card. Once logged in, choose “Schedule appointment.” As you go through the process you will answer the interview waiver questions which will evaluate your eligibility to apply for a visa without an interview. After you answer the questions, you will be prompted to pay the visa fee. If you are eligible to apply for a visa without an interview, you will print out the “interview waiver confirmation letter” which you will include with your visa application. If you are applying for a B1/B2, C1/D or F, M, J visa, please ensure you read and answer all the interview waiver questions carefully. Only answer Yes to the questions if you fully comply with all points listed under every question. In case you do not qualify for interview waiver and have wrongfully responded to any question, you will be requested to schedule an appointment for an interview, leading to a delay of 1-2 weeks in your visa issuance. Applicants can qualify for interview waiver based on past U.S. travel (if the applicant possesses a visa that expired within last 12 months) or based on age (under 14 or 80 or older). Gather your DS-160 confirmation page, interview waiver confirmation letter with barcode, current and previous passports, photo, and any other required supporting documentation. Depending on the visa category, you may also be required to pay a reciprocity fee. Please refer to your specific visa category page for additional required documents. http://www.ustraveldocs.com/hk/hk-niv-appointmentschedule.asp and attend a visa interview. Take your interview waiver confirmation letter, DS-160 confirmation page and all the required documents for your visa class along with an A5 mailing envelope to enclose your documents to one of the collection facilities listed below. Elink Station (Kwun Tong) RM 109, 1/F, Block G, East Sun Industrial Centre, 16 Shing Yip Street, Kwun Tong, Kowloon (MTR Kwun Tong Exit B1). Opening hours Monday to Saturday 11:00 am-10:00 pm. Closed on Sundays and Public Holidays. Elink Station (Cheung Sha Wan) Flat 5,1/F, Yee Kuk Industrial Centre, 555 Yee Kuk Street, Cheung Sha Wan, Kowloon (MTR Cheung Sha Wan Exit B). Opening hours Monday to Friday 11:00 am-8:30 pm Saturday 11:00 am-7:00 pm. Closed on Sundays and Public Holidays. Elink Station (Tsuen Wan) Workshop No.9 on 9th floor, Mega Trade Centre, 1-6 Mei Wan Street, Tsuen Wan, New Territories (MTR Tsuen Wan Exit A3). Opening hours Monday to Saturday 11:00 am-10:00 pm closed on Sundays and Public Holidays. Elink Station (Mong Kok) Unit 15, 16/F, Gala place, 56 Dundas Street, Mong Kok, Kowloon (MTR Yau Ma Tei Exit A2). Opening hours Monday to Saturday 11:00 am-10:00 pm closed on Sundays and Public Holidays. Elink Station (Wan Chai) Room 1402, 14/F., Eastern Commercial Centre, 397 Hennessy Road, Wanchai, Hong Kong (MTR Causeway Bay Exit B). Opening hours Monday to Saturday 11:00 am-10:00pm closed on Sundays and Public Holidays. Note: Please do not submit any documentation in a sealed envelope as this will be rejected by the U.S. Consulate. If you use an envelope to submit documents, it must remain open at all times. The U.S. Consulate will keep your passport and application for processing and adjudication for approximately 7-10 working days. At the end of the visa adjudication process, the Consulate General in Hong Kong will return your original documents and your passport to you according to the document delivery option you have chosen (Pick-up or Delivery Service). If issued, your passport will contain your visa. Important Note: The use of the interview waiver does not guarantee visa issuance. In some cases, applicants may still be required to appear for a visa interview at the Consulate General Hong Kong, e.g., incomplete and/or inaccurate applications.